CM-10GT-SFP - Managed 10 Gigabit Media and Rate Converter Module: 10/100/1000/2.5G/10GBase-T to SFP+ slot (empty). Managed or unmanaged operation. CM-10GRT-SFP - Managed 10 Gigabit Media and Rate Converter Module: 10/100/1000/2.5G/10GBase-T (RJ-45) [100 m/328 ft.] (CAT6A or better ) to SFP slot (empty). Fiber SFP support for 1G or 10G. Copper SFP support for 1G. Managed or unmanaged operation. 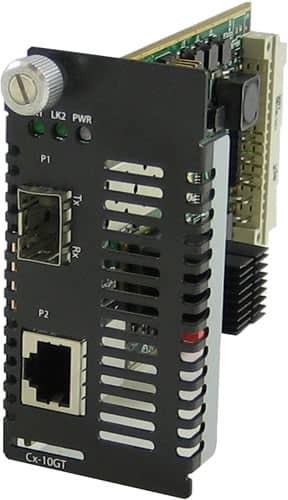 A Fiber to Ethernet Media Converter designed to be installed in the MCR200 or MCR1900 Modular Chassis System. The 10GbE Media Converter comes with one RJ45 Ethernet port and one pluggable transceiver port that supports fiber to fiber, copper to fiber or copper to copper media conversion. This Media Converter can automatically detect 10/100/1000/2.5G/10G Ethernet port speed and do a rate conversion between the two ports if the Ethernet speed is different. The pluggable fiber optics port allows for flexible network configurations using SFP transceivers supplied by Perle, Cisco or other manufacturers of MSA compliant SFPs. These Managed Modules are designed for environments where network security is critical. By using them in conjuction with an MCR-MGT Management Module installed in the chassis, support is enabled for all authentication, authorization and accounting (AAA) security services used in corporate networks, including TACACS+, RADIUS, LDAP, Kerberos, NIS and RSA. And, to further protect ID's and passwords from someone snooping on the network, Perle Managed Fiber Converters provide secure management sessions by supporting SSH, SNMPv3, Telnet and HTTPS. For complete product details and technical specifications, please visit our CM-10GRT Media Converter Module Product Page.